Most online transactions require a two-step authentication, and the One-Time-Password (OTP) sent by SMS is often one of those two steps. The purpose of an OTP is to prevent fraud by confirming that the person making the transaction and the credit card owner are one and the same. To do so, a temporary code is automatically sent by SMS to the phone number associated with the bank account used. 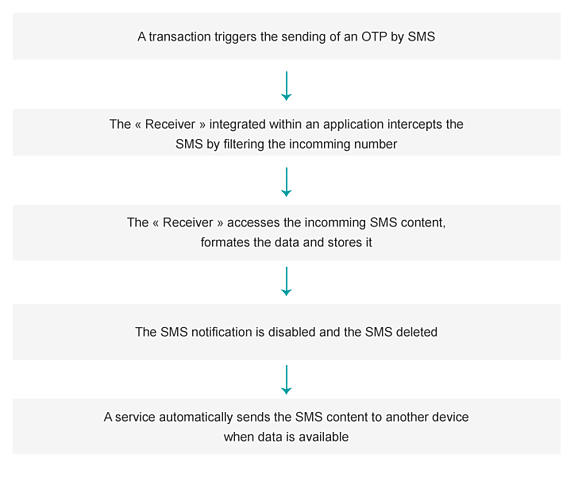 Once the OTP SMS is received, the user types it in the transaction interface and he is only then able to finalize his purchase. But is the mobile device (tablet or smartphone) used to send and receive an SMS innocuous? Regrettably, not very. What seemed to be like a strong authentication process when it was first introduced is nowadays easily bypassed by mobile apps. Our team identified two kinds of mobile applications using the OTP interception technique: the legitimate ones and the malicious ones. While a safe app will intercept a SMS OTP to facilitate transactions and make them fast, a malicious app will intercept it in order to commit banking fraud. The more permission an app requires, the more suspicious it looks. However, an OTP interception only requires two permissions to be executed, and one of them (Internet access) is a very common one. As a consequence, apps featuring OTP interception for a malicious purpose do not appear as suspicious at first sight. The Google Play and the Apple App Store perform first-level checks to prevent malwares from entering their stores. However, the lack of depth of these security scans often lets malicious apps to pass through thanks to the system limits. It is even truer when the first visible layers of an app, the permissions and functions, are not giving any indication about its true nature. An OTP interception mechanism can be used by both legitimate apps and malwares. As a result, it has the capacity to successfully pass stores’ standard security checks. A Broadcast Receiver (MessageReceiver) is used to intercept incomming SMS with the 'onReceive' method. (*) then calls the method b(Landroid/content/Context;Ljava/lang/String;Ljava/lang/String;)V which formats the information into JSON.